Our gentle, compassionate team can care for your child's smile from his or her first baby tooth to the last permanent tooth, and every step along the way. The American Academy of Pediatric Dentistry recommends children visit the dentist when their first tooth erupts or by their first birthday. We specialize in caring for the new teeth of our young patients. 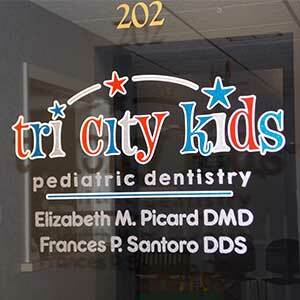 Dr. Elizabeth Picard and the entire Tri City Kids team welcome you and your children to our Bay City dental practice. We look forward to taking care of your children's smiles for years to come! Welcome to Tri City Kids Pediatric Dentistry, where we care for kids’ smiles! Dr. Elizabeth Picard and the Tri City Kids team are friendly and compassionate. They truly love seeing the smiles of children in the office and helping those children have positive dental visits. Good dental experiences early in life lead to the development of good oral health habits and a lifetime of beautiful, healthy smiles. At our Bay City dental practice, we want kids and parents alike to feel comfortable, so we’ve designed an office that you and your children will enjoy visiting. The relaxing atmosphere helps keep kids comfortable, and our comprehensive pediatric services ensure that their smiles are well taken care of. We look forward to caring for your child’s smile for years to come. Call us today to schedule an appointment!